Those awaiting results of August 2015 Sanitary Engineer board exam can find here the complete list of passers, top 10 (topnotchers), top performing schools and performance of schools as the Professional Regulation Commission (PRC) and the Board of Sanitary Engineering released results in 2 working days after the exam. PRC on Tuesday announced that 77 out of 132 passed the Sanitary Engineer Licensure Examination. 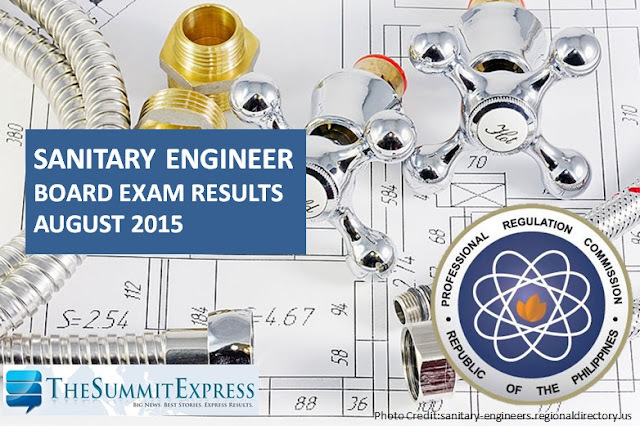 Sanitary Engineer board exam was administered on August 25, 26, 27, 2015 in Manila. The second Sanitary Engineering board exam this year covered the following subjects: environmental engineering and public health engineering (Day 1), sanitary science as applied to buildings and civil engineering (Day 2), waste water and water supply engineering (Day 3). In August 2014, results were released in two (2) working days. A total of 106 out of 166 passed the Sanitary Engineer Licensure Examination. In January this year, results were out online after 6 working days. PRC named 24 out of 56 who have hurdled the exams.